ABB Robotics has gone on a streak of packaging robots with controllers and/or software to simplify the adoption of robots in specialized applications, such as welding and cleanroom. The industrial robot maker’s latest move is a package that puts together hardware and software for high-speed, end-of-line palletizing. The PalletPack 460 is a pre-engineered package that includes the company’s new IRB 460 robot, which was specifically designed for high-speed, end-of-line palletizing applications. The package aims at making it easier for integrators to specify and design palletizing systems. It’s also designed to lower the barriers to entry for end users into the adoption of robotic palletizing automation. PalletPack 460 consists of fully documented, integrated hardware to lower overall project costs and reduce engineering setup time by making it easy to integrate and program the robot and its controller. The function package comes in either a high-speed bag palletizing version or a compact, end-of-line case palletizing version. It includes an IRB 460 palletizing robot, a Flex-Gripper end-of-arm tool, an ABB control PLC, a Jokab safety PLC, PalletWare support software, and user documentation. 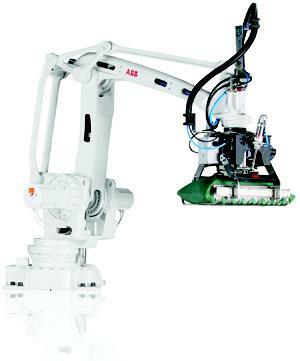 It also includes the ABB FlexPendant, which is the standard ABB Robotics human-machine interface (HMI). The FlexPendant has a graphical interface with four screens for pallet and pick setup, pallet pattern setup, path profile edition, and movement edition. Simplified programming is one of the package’s key features, as it is in ABB’s ArcPack Lean 1410 package for welding, which has an interface simple enough to be sold off the shelf. While the PalletPack 460 may not be that simple, its programming wizard makes the programming very similar to that used for a traditional PLC. This makes it possible for PLC programmers who don’t have experience in programming robots to program the system. The 4-axis IRB 460, which ABB claims is the fastest known palletizing robot available, has a reach of 2.4m and a payload capacity of 110kg. It can achieve up to 2,190 cycles per hour with a 60kg load. Its compact, 100.7cm x 72.0cm footprint lets pallets be placed closer to the robot, and makes it easier to integrate it into existing packing lines.